Owned by Italy's largest insurance firm, Generali, and designed by Eric Parry Architects, Fen Court is a fifteen story state-of-the-art office block which houses M&G's headquarters. So far, so ho hum. But what marks it out from the other skyscrapers is up on the 15th floor: The Garden at 120. Like the Sky Garden at 20 Fenchurch Street, this lofty urban oasis is a free-to-access, open-to-all public roof garden and offers wonderful views of the city. 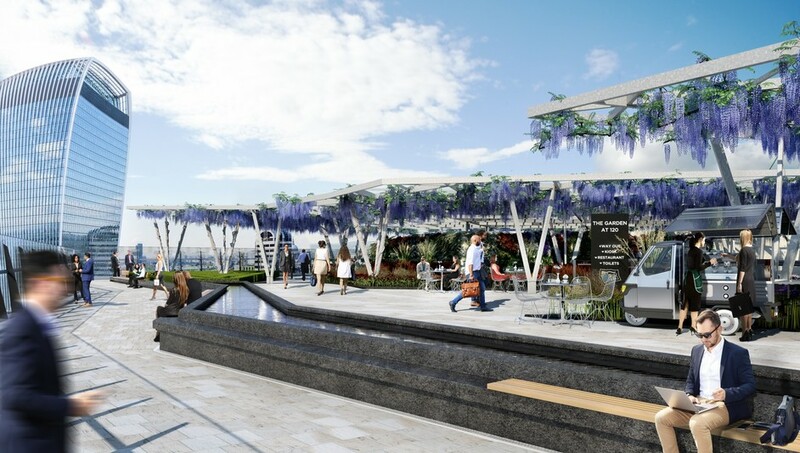 Designed with German landscape architects Latz + Partner, the roof garden is planted with pink roses and wisteria which climbs up the steel pergola canopies. One floor down, on level 14, is a restaurant run by the D&D Group, who also own the German Gymnasium in King's Cross and 40 other UK restaurants. The Garden at 120 gyms, sporting activities, health & beauty and fitness. What are the best dining options near The Garden at 120 London? The best pubs near London The Garden at 120. The Garden at 120 clubs, bars, cabaret nights, casinos and interesting nightlife. Where to have your meeting, conference, exhibition, private dining or training course near The Garden at 120. From cheap budget places to stay to luxury 5 star suites see our deals for The Garden at 120 hotels, including DoubleTree by Hilton Tower of London from 87% off.